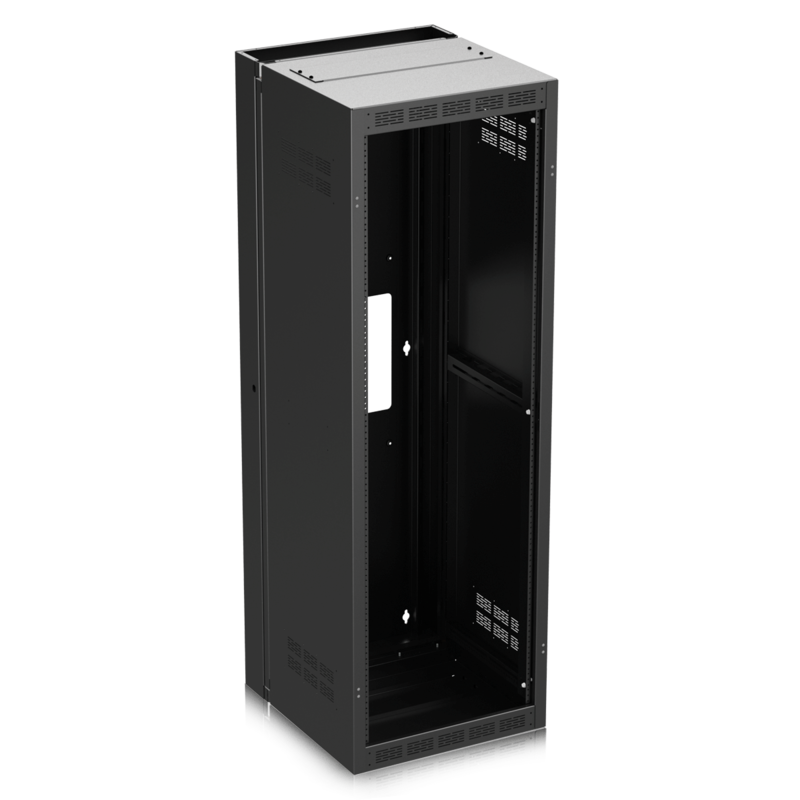 The WMA Series wall cabinets are 16-gauge, welded with 18" deep center-section and adjustable mounting rails, and a 4 1⁄2" deep rear section. Panel space openings range from 10 RU to 35 RU. 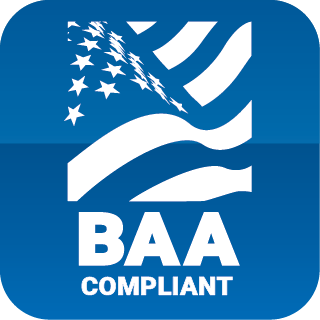 Cabinets are equipped with provisions for custom cabinet mounting, wire man­agement, equipment mounting, and structural support. Cabinets are finished in a black electrostatic powder coat. All models include adjustable front rack rails tapped 10-32, and manufactured to standard E.I.A. 1⁄2" spacing. 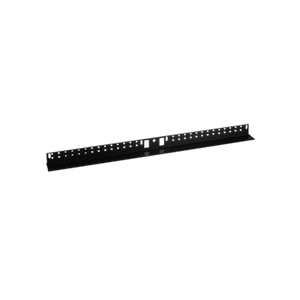 Hat channels provide adjustable rack rail support with securing holes for fixed positioning of rails. 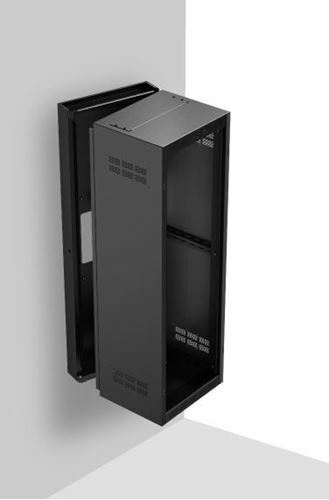 Top and Bottom removable 3RU panels are located in the center section of the cabinet for EFP Series fan panels for further ventilation or for isolation panels for power. The back face of the rear section is equipped with 1⁄4" deep boss detents which give Contractors field flexibility to install a custom plywood, aluminum, or steel sub-plate for mounting accessories inside the cabinet. Boss detents are on 12" centers. The rear section provides an interchangeable Right or Left hand cylinder lock for security. The cabinets have 16 conduit knockouts on the top of the rear section and 16 on the bottom of the rear section. Knockouts consist of two 1/2" (12.7mm) standard, three 1" (25mm)/1 3/8" (34.9mm) concentric and four 1⁄2" (13mm) / 3⁄4" (19mm) concentric. The cabinets offer a non-sagging design. The units' one-piece front and rear sections are strengthened with an internal alignment frame that supports the center section of the cabinet through its entire travel range. An optional caster for carrying the weight of the center sections is available (Atlas CT31A). New, Continuous Slot "Hat Action" Design Allows Full Front to Back Adjustment of Rails. Securing Holes Top and Bottom Provide Fixed Positioning of Rails. Ships with One Set of Plated Rack Rails and (100) 10/32 x .75" Rack Screws with Captive Washers. "Optional Rear Rack Rail Pair Model WMA-RRxx(Height Per Model) Also Available"